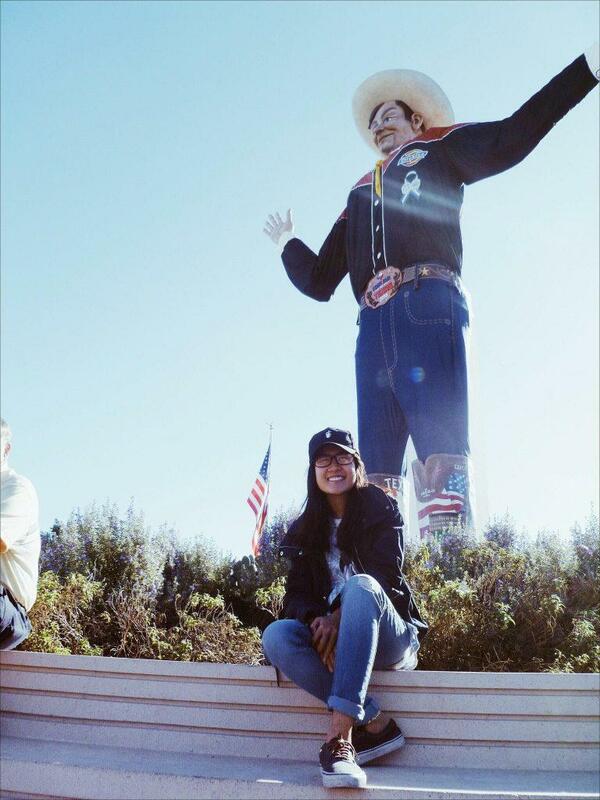 Photo courtesy of Thao Nguyen | Thao Nguyen, a Brookhaven College student, visits the State Fair of Texas. Many people come to the U.S. to pursue the American Dream, and so did I. I thought about studying abroad since I was 10 years old, asking my family if I could go to America when I grew up. Years passed by, and I still dreamed about it. Then, one day in 2016, I left my hometown in Vietnam when I was 19 for the land of the free and better opportunities. I am currently achieving goals I set for myself. I am doing well in all of my classes and I learned fascinating things about my journalist dream job. I am writing for The Courier and I have had five stories published this semester. I also got the opportunity to attend the 2018 Texas Intercollegiate Press Association covention, compete in the Radio News live-contest and listen to speakers from publications in Texas. It was an eye-opening experience for me. Receiving the opportunity to write, and meet people in the industry made me feel like I am one step closer to my goal. My media writing professor, Daniel Rodrigue, is impressed by what I have accomplished. I was very shy at the beginning of this semester. When I got an assignment to interview five random people on campus, I freaked out. I am an introvert and I was afraid to start conversations. But now, I have interviewed more than a dozen people. As I started to talk to more people, I understood their stories and passions which made me love what I am doing even more because I feel like I am their voice and I present their stories to the public. But things have not always been this way. When I was 5 in Vietnam, my mom sent me to a Catholic kindergarten and the nuns handed me a notebook with drawings and words next to them. The nuns told me it was English. I was surprised because I never knew other languages existed. I went home, excited to tell my mom I learned English that day. She was really happy about that and told me English skills would help me succeed in life. Since that moment, she played English music and cartoons for me every day. As I grew older, I listened to more songs and watched more movies in English. I understood most words, and for the ones I didn’t, I looked up the lyrics online and wrote them down so I could remember. Now I want to be a journalist. I want to serve the public because everyone deserves the truth. But it is not always easy. My home country is corrupted. Journalists cannot report any news of the government’s wrong-doings. I got frustrated seeing people who fought to report the truth and protect civil rights end up in jail. It was depressing to know we have no voice in our own country – our government does not protect us. I decided to go study in a country where I knew I had freedom to pursue my dream, so I moved to America. But here I found new challenges. I started to have some doubts about my dream, but I chose to pursue it anyway. I kept thinking as long as I tried 10 times harder than anyone else, I might have a chance. My first two semesters at Brookhaven College caused my doubts to grow bigger. I did not take any classes for my major at the time, and my work in ENGL 1302 made me doubt my ability. I wondered if I made the right choice. I will never forget how proud my family was when my first story got published. My mom was so happy and proud she teared up. Even my cousin, Le, finally believed in me. I did not think homesickness would be a challenge when I left Vietnam because I am very independent. Six months went by and I was still doing well. I talked to my family every day on the phone. My mom visited me last year and we had so much fun together, but when she left I cried a lot. I think it reminded me how much I missed being around her. The hardest thing I had to deal with was when my grandma died last year and I could not be there. It made me hate myself because she was always there for me, and I could not be there for her one last time. But after that, I kept telling myself to try harder so she can be proud of me. I think studying abroad opens doors to many opportunities. I have become more mature and stronger than I have ever been. I think everyone should try to travel or study abroad while they are young. People will be amazed by what they learn and the people they meet. This entry was posted in Column by The Courier. Bookmark the permalink.